You’ve got to admit, it’s a pretty exciting stage of any new project. However, before we get too far along, we find ourselves pumping the brakes. Alright, let’s back up and talk about your users for a minute. Who are they? At what point do they realize they may need your product? What are their motivations? Exactly what are they hiring your product to do? We often get some pretty fuzzy and overly generic responses. The client will say they "have been working in industry x for years," and they "know their customers inside and out." They’ll rattle off a few generic behavioral attributes and key motivations. Done deal. There’s no need to research the topic any further. Right? So, let’s just get to building the damn app. The problem is that clients don’t always know to ask the right questions. They spend a great deal of energy analyzing the nitty gritty details of their idea, and they miss the most obvious insights. Often, what is observed is not really what’s happening. For one reason or another, we all can become blind to the obvious and incapable of seeing things differently. There are many factors that could cause blindness. Sometimes cognitive bias is a significant contributing factor, and sometimes it can come from cognitive load or inattentional blindness. There could be a number of other issues, but let’s stick with these for now. The point of this post is to get you thinking, "do I really know my users?" According to Wikipedia, a cognitive bias is a systematic pattern of deviation from norm or rationality in judgment. Individuals create their own "subjective social reality" from their perception of the input. An individual's construction of social reality, not the objective input, may dictate their behavior in the social world. Thus, cognitive biases may sometimes lead to perceptual distortion, inaccurate judgment, illogical interpretation, or what is broadly called irrationality. 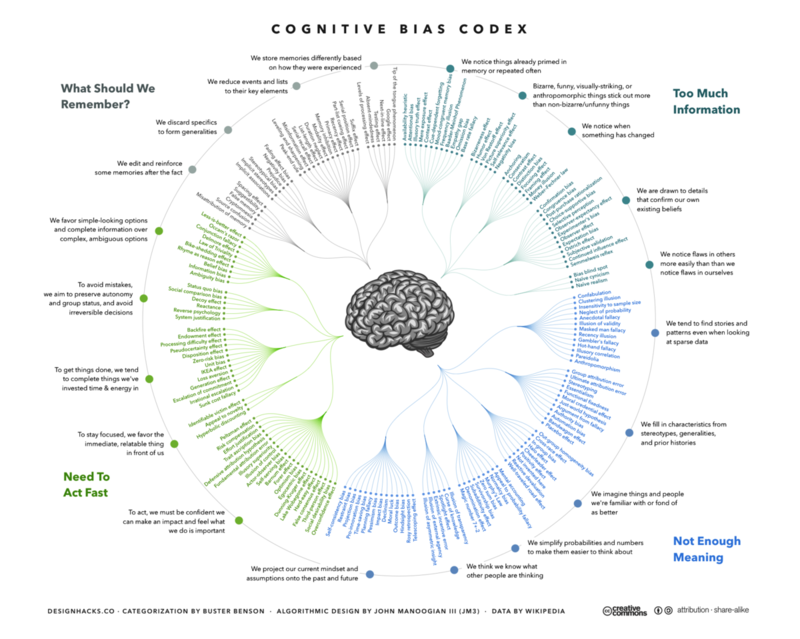 The illustration above does a great job of highlighting many of the popular biases and how our brains deal with the (mis)information. And here are a few more useful examples we pulled from a rather exhaustive list of cognitive bias. Anchoring bias: The tendency to rely too heavily, or "anchor", on one trait or piece of information when making decisions (usually the first piece of information acquired on that subject). Bandwagon effect: The tendency to do (or believe) things because many other people do (or believe) the same. Clustering Illusion: The tendency to overestimate the importance of small runs, streaks, or clusters in large samples of random data (that is, seeing phantom patterns). Curse of Knowledge: When better-informed people find it extremely difficult to think about problems from the perspective of lesser-informed people. Illusory correlation: Inaccurately perceiving a relationship between two unrelated events. An oversimplified definition of cognitive load is that the human brain only has the capacity to focus on a limited number of things at one time. That’s, also, somewhat related to inattentional blindness where the observer is focusing on specific activities and attributes and misses something that should be completely obvious. The following "Monkey Business Illusion" video is a classic example of inattentional blindness. In a different study, Daniel Memmert discovered that experienced basketball players identified the gorilla more frequently than novice basketball players. This is noteworthy for our discussion. As mentioned above, bringing in an experienced outside perspective can potentially help reduce bias influence in understanding your users. It has other benefits as well. An experienced researcher can help you ask the right questions and see through the chaos much like the experienced basketball player in Memmert’s experiment. Here’s one more video you should watch. Clever, right? So, what does all of this have to do with knowing your users? There's a good chance you don’t know your users as well as you think you do. Even if you uncover just one or two additional nuggets of wisdom, it’s worth taking the time to explore the pains, motivations, and journeys of your users. Unfortunately, you can never be completely free of bias. Even if you think you’re pretty savvy, there’s a bias for that too—blind spot bias. However, this is where a good product (and UX) team can assist. Product teams can work with clients to shake a few biases that may be limiting the client’s ability to really understand their users.